Special Containment Procedures: SCP-4449 is to be contained in a standard low-threat humanoid containment cell. SCP-4449 is to be interviewed weekly for the purposes of maintaining its psychological health and to acquire further information concerning its past and anomalous properties, with special scrutiny applied to any mention of the crimes of Daisuke Kawamoto or the current state of affairs in Higashishirakawa, Japan. SCP-4449's body is composed of sack cloth and stuffed with cotton and straw. This material is susceptible to wear and damage and does not exhibit any anomalous durability, nor do its clothing or armor (which are removable). However, if SCP-4449's body sustains damage, it can be repaired or replaced using conventional and readily available materials such as cloth, twine, and additional stuffing. This interchangeability and anomalous integration of new materials is suspected to be responsible for SCP-4449 remaining in serviceable condition despite its age. In addition, SCP-4449 is able to remain upright and balanced while wearing its armor despite the protective equipment outweighing its own body by approximately 14 kilograms, and it is able to lift and move weights of up to 115 kilograms, having the overall approximate physical strength and agility of an athletic and healthy human male of its size despite its low mass and lack of biology. It has proven capable in a combat capacity and has demonstrated intimate, detailed knowledge of both Edo period kenjutsu and bōjutsu2, to the point of being reliably able to match and occasionally best master-level Foundation practitioners of these martial arts in authorized sparring matches. SCP-4449 is sapient and capable of speech in Edo period-appropriate Japanese, although it is unclear how this is physically accomplished, as SCP-4449 lacks organs responsible for speech and furthermore lacks a face entirely without its mask. Its personality is predominantly genial, courteous, gregarious, and respectful, if somewhat bombastic and opinionated. 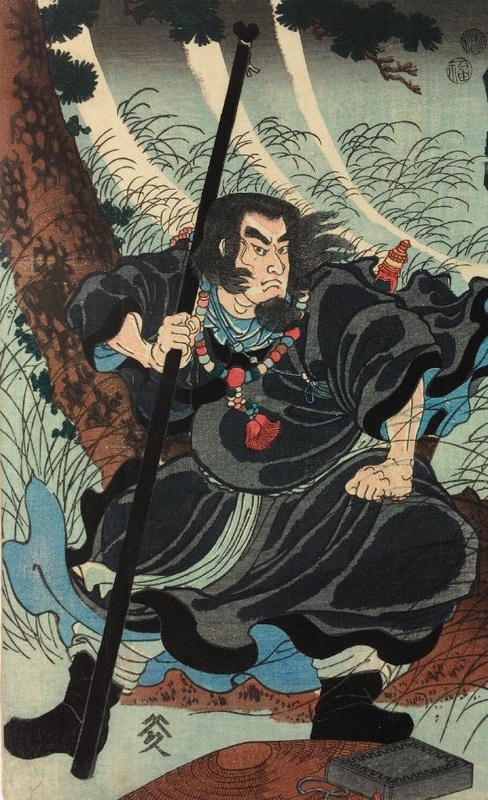 SCP-4449 is aware of its status as a non-human construct, and claims to be the disembodied spirit of Daisuke Kawamoto, a samurai who (according to SCP-4449) was born in 1799 in the outskirts of Tokyo (then known as Edo) and directly served the Tokugawa Shogunate3 as both a soldier and political and military strategist. SCP-4449 further claims that its spirit was placed into its current housing via a magical ritual immediately following its death in 1888, so that it could continue to serve its descendants and the village in which they lived as both a mentor and guardian. It also alleges that its existence as a spirit allows it to both perceive and interact with other spirits, and that it uses this ability to combat the yōkai4 that regularly threaten its village's citizens. History and Discovery: SCP-4449 was recovered from Higashishirakawa, a small village located in Gifu Prefecture, Japan. Accounts gathered from the residents of Higashishirakawa indicate that SCP-4449's existence had been common knowledge within the village for more than a century, with numerous photographs and written accounts featuring SCP-4449 being kept in the village's records, the earliest of which dates to 1893. Due to the village's isolation, lack of available public transportation lines, and a moot agreement within the community to avoid mentioning SCP-4449 to any visitors, the Foundation remained unaware of its existence until April 22, 2006, when a video of the entity openly walking down a populated street was posted to the Internet. The citizens of Higashishirakawa accepted SCP-4449's presence, and would freely greet or speak with it as it traveled both within the village's center and its outskirts. Interviews conducted with multiple citizens reveal that the populace saw SCP-4449 as a somewhat unusual but harmless, helpful, and even benevolent entity. A small number of of the village elders maintained that SCP-4449 was proof of the existence of the afterlife, and was a sacred ancestor sent to act as a guardian against evil spirits as a reward for their faith. The majority of the population, however, saw no evidence of SCP-4449's claims of combating yōkai and merely assumed that SCP-4449 was some form of delusional ghost. among a multitude of others. As a result of these behaviors, SCP-4449 was held in high esteem by the majority of the village residents and local officials. It was particularly popular with children, who referred to it affectionately as “Kakashi-san”5 and with whom it would regularly play when not in a supervisory or teaching capacity. Foundation historical researchers have uncovered genuine records and accounts of a samurai by the name of Daisuke Kawamoto who lived during the late Edo period. Information concerning this individual is somewhat scarce, but a recorded birth year of 1799, a death year of 1888, and an occupation as a soldier and strategist have been confirmed in concordance with SCP-4449's claims. However, all written accounts that reference Kawamoto in detail, regardless of their source, consistently and emphatically describe Kawamoto as having been a notoriously cruel and ruthless man, with a reputation for dispassionate killing and a lack of regard for honorable conduct upon the battlefield. In these accounts Kawamoto is often referred to by the epithets “The Blood-Soaked Executioner” or “Gashadokuro6", as a result of his imposing stature, gaunt features, taciturn and impassive personality, and purported love of bloodshed. Kawamoto is said to have been responsible for numerous war crimes and atrocities during his tenure within the Shogunate and throughout the course of the Boshin War7, including the burning of crops, recreational torture and murder of prisoners, refusing death rites to enemy combatants, and the repeated slaughter of non-combatant civilians. Noted frequently is Kawamoto's persistent unwillingness to spare the children of those opposed to the Shogunate, which earned him criticism and revulsion from his allies and peers. The specific circumstances of Kawamoto's death are unknown, but consensus among historians derived from what little data exists concludes that he fled the capital upon its capture by Imperialist forces and assumed a new identity, living in seclusion for the remainder of his life in the countryside. A small number of accounts then attest that his true identity was discovered immediately following his death, and his body was taken by a nearby sect of Shinto priests to be burned, as penance for his crimes. However, Kawamoto's grave has never been located, nor have his remains, and these accounts remain unverified. SCP-4449 has been respectfully cooperative toward Foundation personnel, with the sole exception being its firm but polite requests to be released from containment, insisting that its village is defenseless against predatory yōkai in its absence. After more than a decade of both conventional and thaumaturgical surveillance, no creatures matching this description have ever been detected within the vicinity of Higashishirakawa. Additionally, while SCP-4449 has been compliant and predominantly truthful during interviews and has provided consistently verifiable information, on no occasion has it addressed, acknowledged, or admitted to any of the unscrupulous or immoral acts attributed to the man it claims to have been. The reason for these omissions is currently unknown pending further questioning. Addendum 4449-01: On October 31st, 2017, following a national census and population survey period, Foundation agents embedded within the Japanese government discovered multiple statistically improbable and alarming data points associated with the village of Higashishirakawa. Since 2006, rates of physical and mental illness reported by the population of Higashishirakawa have consistently increased. As of late 2017, Higashishirakawa's infectious disease, genetic disorder, schizophrenia, major depressive disorder, suicide, cancer, and infant mortality diagnosis rates have risen to more than quintuple the national per capita average, to the point of exceeding total rates reported by towns with ten times Higashishirakawa's population. The village's violent crime rates have also greatly increased, with larceny, kidnapping, sexual crime, child neglect and abuse, domestic abuse, and murder all rising to unprecedented levels, far exceeding rates reported from any other period in the village's history. In eleven years, Higashishirakawa's residential population has fallen from 2,677 in 2006 to 1,004, due to a combination of incarceration, emigration, or death. No definitive or verifiable explanation for this abnormality has been found by the Japanese government or the Foundation, nor has any demonstrable correlation between these trends and SCP-4449's containment been determined. SCP-4449's status has not changed. Upon questioning, SCP-4449 professed to have been unaware of the state of affairs in Higashishirakawa and demanded to be released from Foundation custody immediately, insisting that it was now the village's “only hope” and that disaster would soon befall Higashishirakawa, and subsequently the entirety of Japan, if it were kept in confinement. This request was denied. Investigation into these events is currently ongoing. 1. Armored helmet and full-face mask, respectively. 2. Martial arts pertaining to the use of the sword and quarterstaff, respectively. 3. The last feudal military government of Japan, which ruled from 1600 to 1868. 4. A group of of supernatural entities from Japanese folklore that include various monsters, spirits, and demons, frequently depicted as being mischievous or malevolent. 6. A specific variety of violently predatory yōkai commonly depicted as a human skeleton roughly fifteen times the size of a normal man, said to be formed of the bones and angry spirits of those that either die of starvation or die in battle and are not buried. 7. Also referred to as the Japanese Civil War, fought between the reigning Tokugawa Shogunate and those intending to restore governmental power to the Emperor and the Imperial Court, lasting from early 1868 to mid-1869. The Boshin War ended the Edo period and resulted in the dissolution of the Shogunate, the decline of the samurai, the onset of widespread Japanese modernization and interaction with the Western world, and the beginning of the Meiji Era.